To most, the Republic of Moldova is the great unknown. And rightly so, as it’s a landlocked country about the half the size of Ohio, with a population that is arguably the poorest in Europe. If you were to ask the average person, “Where’s Moldova?,” you’d be lucky to get a response that was even remotely near the actual location of the country. The closest one comes is, “That’s part of Russia, right?,” and that would have only been marginally true in the past, but thankfully no longer. Moldova is a sovereign state and as such, it has its own unique history, language, traditions, and perhaps most importantly, food. But, just as most people will readily admit ignorance of Moldova, it should come as no surprise that the rich and varied cuisine of Moldova is largely unknown as well. For centuries Moldova was governed by foreign empires as diverse as the Ottomans and the Russians. These occupiers brought not only their rule, but also their culture, much of which remains as vestiges in the food that Moldovans call their own. For example, the dish known as sarmale, which is cabbage rolls filled with rice and pork, is called sarma in Turkey. Likewise, the vegetable soup known as borș is clearly derived from borshch (борщ), which was introduced by Moldova’s Slavic neighbors in Ukraine. 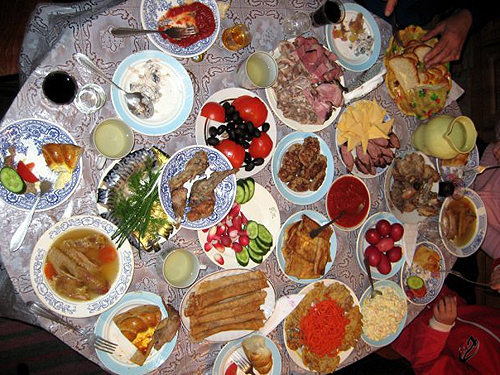 Although much of Moldova’s culinary tradition has been shaped by its past as vassal state, there are several foods that are more local in nature, such as mămăligă and ciorbă. These dishes are also found in Romania, which shares much of its culture with Moldova. Had it not been for the power struggles and land grabs between the Ottoman, Russian, and Austrian Empires, present day Moldova would probably be a part of Romania today. Of the aforementioned foods, the most popular is mămăligă, which is a dish of boiled corn meal, eaten with the hands, that is served with a side of sour cream and shredded cheese. The dish is easy to make, inexpensive, and healthy, save for the gratuitous amounts of sour cream and cheese that often accompany it. Ciorbă, a sour vegetable soup with several variations in ingredients, is likewise easy to prepare, inexpensive, and healthy. Of the many Moldovan foods, my favorites are mămăligă and chiroște, which is dumplings filled with either cheese (brânză), cabbage (varză), potato (cartofi), and sour cherries (vişine). Chiroște is probably better known as varenyky (варéники) in Ukrainian and colțunași in Moldova. To clarify (or perhaps to further confuse) chiroște is the colloquial name for colțunași, which is a dish that is largely unheard of in Romania, given its Slavic origin. It’s possible that it’s eaten in Romanian Moldova, which is one half of a historic region that is currently split between the two countries (with Iaşi being the former capital). Regardless, it’s a delicious food and easily my most longed for dish from my time in the Republic of Moldova, where I served as a Peace Corps volunteer. While in the Peace Corps, I lived with a host family, which for me was an eighty year old woman whom I addressed as Nanuca. Born to a Ukrainian mother and Moldovan father, her given name is Nadejda Munteanu and she is typically Moldovan, in spite of her Slavic first name (that translates to “hope” in Ukrainian). Having been born in a Ukrainian village and then moving to a Moldovan village as a child (all the while living in what was then Romania), she speaks both languages fluently, in addition to Russian. She’s lived through Greater Romania, the Soviet Union, the post-WWII famine, the death of her only child, a divorce from a philandering husband, and the still shaky transition to both democracy and capitalism. She also survived hosting two Peace Corps volunteers, through which she presumably made use of the store of patience that she accumulated through her years of trials. 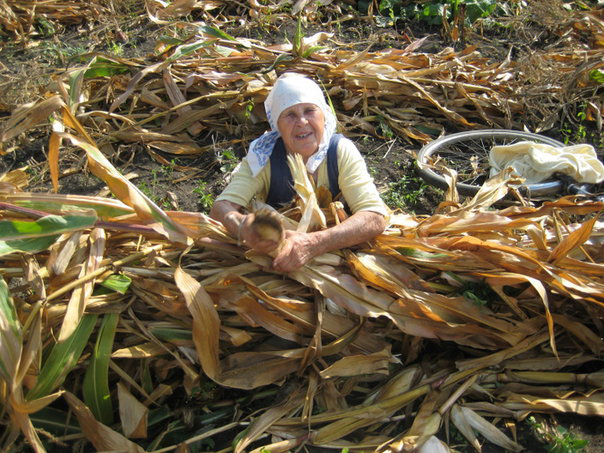 Living with Nanuca was an education in life as a near-subsistence farmer in the Moldovan countryside. During growing season she toils from sunrise to sunset to grow the vast majority of the food that she eats. As a result, she knows the provenance of the meals that she cooks and is justifiably proud of what she makes. She, and many thousands more like her, are the unknowing embodiments of the ethos of eating organic and locally sourced food. The irony is that she’d prefer to work less, if opportunity allowed her to free herself from the land. Her daily struggle to turn seeds, soil, and water into sustenance leaves her with very little time to relax. The only respite she allows herself is on Sunday, which is the day she goes to church, visits with her sister, and catches up on her reading. Sunday is also the one day of the week that Nanuca devotes more time to cooking, which often results in a more elaborate dish for dinner. She knows my favorite Moldovan food is chiroște with brânză, so she would often serve it for our post church service meal, even though its preparation is more laborious than a typical meal of borș, potatoes, or macaroni. Her preferred topping for the chiroște is a dollop of sour cream and a smattering of fried onions, which she washes down with a small glass of sour cherry compot (boiled and sweetened fruit juice). We’d often eat our Sunday dinner with her sister Ana and brother-in-law Vanea, who make for great company. Try as I might, I could never eat as many chiroște as Vanea, which I’m sure remains a point of pride for the old man (and rightfully so). I haven’t eaten chiroște since I left Moldova more than a year ago and it’s not for want of desire, either. What stops me is the fear of sullying the memories I have of such a wonderful time and place in my life. I’d be hard pressed to replicate the sensations and feelings that accompany a Sunday dinner with Nanuca. I’m looking forward to returning to Moldova someday to see her again and I’m sure she’ll have a large bowl of chiroște ready for the both of us upon my arrival. In large mixing bowl, combine 3 cups of flour with one egg, warm water, salt and one tablespoon of oil. Mix well. Knead in the remaining flour until smooth and pliable. Let stand 10 minutes. In a bowl, add an egg yolk to the cheese and mix well, then set aside. Next cut the dough into pieces and roll flat (1/8 inch thickness). Cut circles in the dough using a drinking glass. Continue rolling and re-rolling dough until you have as many circles as possible, using additional flour if needed to keep the dough from sticking. Take a dough circle in your palm and scoop in a small spoonful of the cheese filling. Dip your fingers into a little water, fold over and press edges together. Repeat this process until all of the dough is used. This recipe yields dozens of chiroște, but you may store them in the freezer until ready to use. To cook, add up to 6 to a pot of salted, boiling water. Boil 4-5 minutes, until cooked through and floating. Strain and then transfer to a frying pan with oil and fried onions. Toss, then serve with a dollop of sour cream.